Drive along the coastal plain to Caesarea, once the Roman capital of the region. See the excavations of the Crusader’s city and the Roman port, the aqueduct, and the amphitheater which has been restored to its former glory as a concert venue. Proceed to Megiddo, identified as the site of Armageddon; visit the archaeological excavations including a well-preserved water supply system. Continue to Daliat-el-Carmel, a Druze village, and enjoy a late lunch at a local restaurant. Proceed via Mount Carmel to Haifa for a panoramic view of the Haifa bay and the golden domed Baha’i shrine and gardens. 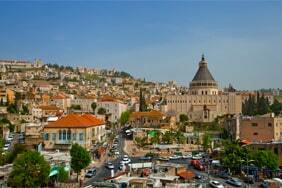 Drive to Safed, the center of Jewish mysticism; visit the ancient synagogues and the Artists’ Colony. Continue to the Golan Heights to see the former Syrian bunkers, Kuneitra and the new Israeli town of Katzrin. Stop at the Golan Winery for a tour and wine tasting. Proceed to Golan Magic for a multimedia presentation of the area and its history . Start the day with a tour of Nazareth and visit the Church of Annunciation; Continue to Tiberias and visit Capernaum to see the ruins of the synagogue and octagonal Church of St. Peter. 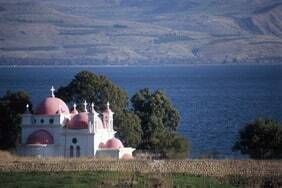 Continue to the Mount of Beatitudes, where Jesus delivered the sermon on the mount. Drive via Bet Shean to Beit Alpha to see the remains of the mosaic floor of an ancient synagogue depicting the zodiac. Start the day with a magnificent panoramic view from the Mount of Olives. Drive to the Old City and visit King David’s Tomb and the Room of the Last Supper on Mount Zion. Enter the walled city and walk through the newly restored Jewish Quarter. 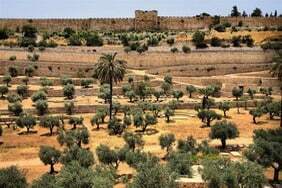 Visit the Roman Cardo and the Herodian Quarter and continue to the Western Wall. Walk along the Via Dolorosa to the Church of the Holy Sepulchre. 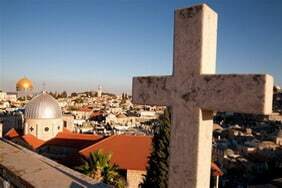 Continue to Bethlehem; view Rachel’s Tomb and proceed to visit the Church of Nativity and Manger’s Square. Drive to the Israel Museum and see the Shrine of the Book, where the Dead Sea scrolls are housed, as well as a miniature model of Jerusalem as it was during the Second Temple period. Proceed for a tour at the Knesset, Israel’s parliament. Continue to visit the Mount Herzl Cemetery and Yad Vashem, the memorial to the Holocaust. Drive through the ultra-Orthodox neighborhood of Mea Shearim and learn about their unique lifestyle. In the evening, enjoy a middle-eastern dinner followed by the Night Spectacular, a sound & light show at the David Citadel (outdoor venue; jacket is recommended). Drive from Jerusalem to the Sheikh Hussein border crossing to Jordan. After border formalities, drive to Jerash, city of the Decapolis, located about 45km north of Amman in the fertile heights of the Gilad. Visit the ancient Roman city with colonnaded streets, baths, the hill of the top Temple, and more. Drive to Amman for a panoramic city tour of the Jordanian capital. After an early breakfast, leave the hotel and travel south on the road to Wadi Musa, the modern village of Petra. Ride on horseback to the “Siq” (canyon) and then on foot to Petra, known as “Sela Edom” or red rock city, the ancient capital of the Nabateans from the 3rd century B.C. to the 2nd Century A.D. Visit the interesting monuments such as the Treasury, El Khazneh (a tomb of a Nabatean king), the field of tombs, obelisks, and the altar (Al Madhbah), where you will enjoy a breathtaking view of the entire city. Drive to Madaba to see the ancient mosaic map of the Holy Land and ruins of historical sites. Continue about 10kms to Mount Nebo, where Moses viewed the Promised Land. On a clear day you can see the Jordan Valley, Jericho, and the Dead Sea. Visit the remains of the Byzantine church with a mosaic floor. Return to the border and Continue to Tel Aviv. 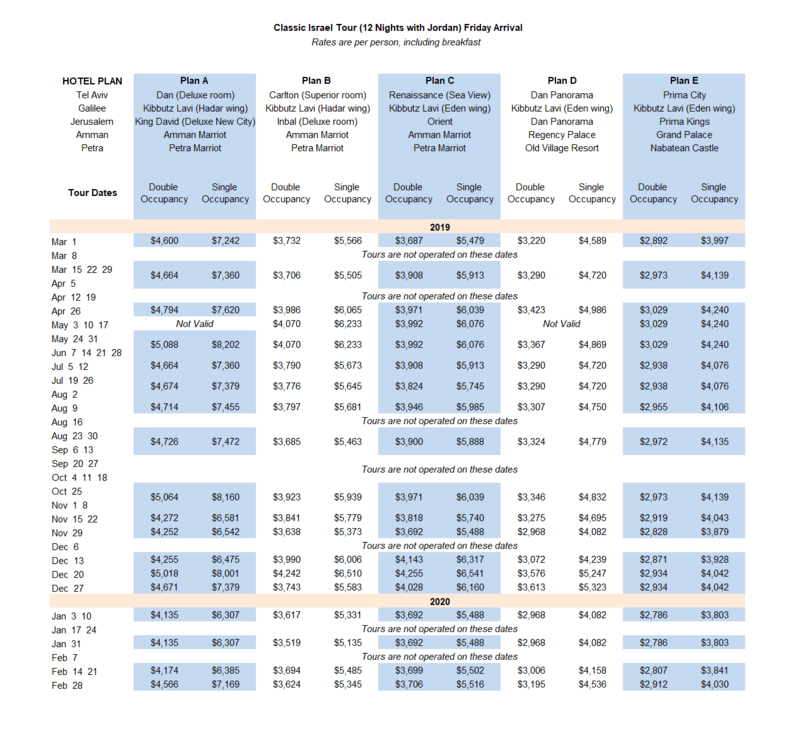 During high season/holidays, the second night in Jordan might take place in Amman instead of Petra.